I took my Late Republican Roman army of Pompus Magnus out for the first time today, and faced a Rise of Macedon army. It would probably be most Roman of me to blame my horrible defeat on the rash allied German cavalry. They rolled a 1 on their warband test to surge forward, charged a unit of slingers (who fired & fled out of range) and opened themselves up to an ugly charge from the Macedonian heavy cav. In fact, that sounds good. Lets blame it on the unreliable barbarians and end further discussion at that. More battle experience is definitely required. The troops also require a whole lot o' paint for morale to improve. Everyone knows painted figures do better. Most of my army is still being painted, so I'm sure they will do better in future games, as I make progress on the painting front. 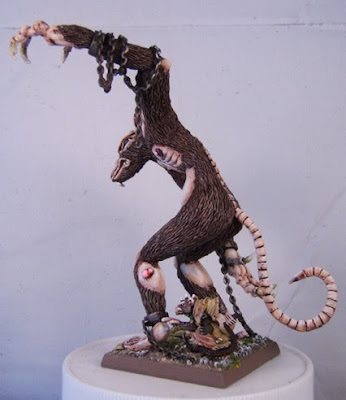 Back in fantasy land, the Skaven army book comes out in another week or two here in the US. I'm already plotting and scheming to put Clan All-Out-of-Bubblegum back into action. I think the core of my army will remain the same: hordes of chittering and squeeking vermin. But there will be a few changes. First is the appeal of a Grey Seer. Possibly on a Bell. I used to take a Warlord 99% of the time using the old book, but I think the new book makes the seer much more appealing than before. Second are the rare slots. I used to run army with either no rare choices, or sometimes I would use the DoW giant as an excuse to field a Clan Moulder monstrosity. The new book, conveniently, gives me an actual monstrosity to field right out of the Skaven book. For now I will continue to use my "giant" as a Hellpit Abomination, but I plan on sculpting up a new, more mutated beastie ASAP. The other rare options also look good. The catapult thingie is the one that first appeals to me. However, the wheel (dumb as the concept is) and the WLC are also decent looking. I'm certain I will be experimenting & switching things around for a while. Back to the special options for the army, I'm stumpped. The plague monks continue to look decent, especially with the new rules for the priest and the Plague Furnace. But the tunnel teams with poison weapons have jumped up in price so much that I think they will go from a standard item in my list to something I rarely take. I'm bitter about the jezzails losing their skirmish formation. They already suffered at the hands of more maneuverable troops, like flying terror beasts, fast cav, and many other "war machine hunters." This is going to hurt them more. Towards the end of my use of the old book a year and a half (or two) ago, I was learning to appreciate the Poisoned Wind Globadiers again, mainly because of their decent performance in the 'Ard Boyz tournament against some of the heavy stuff (like Steam Tanks.) But now that they are no longer core options, I'm not sure about using them. On the other hand, I'm still not thrilled with many of the other special options, so those slots may be open after all. As far as the weapon teams, the first two that seem appealing to me are the Warpfire Throwers, which I've used through all editions of the game in spite of the fact that they've sucked, and/or they've been more likely to cause damage to my own troops. But I feel this time they're due for some success! I also like the look of the Mortar thing. The Ratling guns will probably be staying in storage. Not certain about the others, I need to review their rules in depth. That's about it for now, until I get to read the book in depth. But I plan on doing a little bit of new painting for the rats, so expect to see some pics over the next few months.